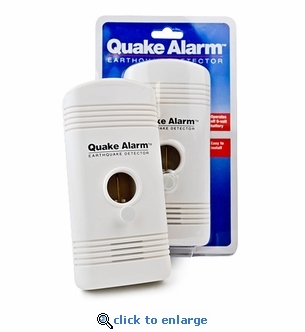 The Quake Alarm will give you precious seconds to respond right when an earthquake is detected. The Quake Alarm earthquake detector can be used to monitor for earthquake activity in homes, offices and schools. The alarm provides early warning of seismic activity by detecting the "P" wave of the earthquake. The "P" wave can be detected and sound the alarm before people can actually feel the earthquake. The Quake Alarm buzzer is loud enough to wake you up when asleep, giving you time to immediately take cover or tend to family members. Mounts to wall. No screws, nails or tools required. Loud alarm to wake you. Offers peace of mind in an earthquake zone. Detects earthquakes that occur miles away.